What’s the first name that comes to mind when you think of durable tennis shoes? Nike Cage 3’s, Adidas Barricades, or Asics Gel-Resolution 7’s? 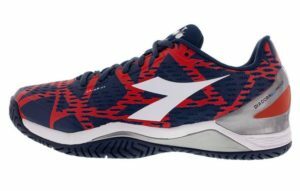 One brand that you probably don’t think of is Diadora. And that’s what you should consider the next time you’re looking for a great durable shoe. The Speed Blushield 2 AG shoes have stayed under the radar but are truly a great choice for avid tennis players. The brand is continuously stepping up to provide high-performance durability shoes for all players thanks to advances in technology. This generation of the Speed Blushield may be their best yet! The Italian brand has continued to include its 6-month outsole warranty and Duratech 5000 wearproof compound, so players know that the shoe offers plenty of durability. However, they have upgraded the upper and midsole technologies to allow for greater ventilation and stability. From the moment I put these shoes on my feet, I knew they were going to be comfortable and stable. The Ortholite insole and Blushield technology make these shoes soft to move in. 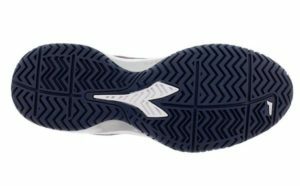 Your feet will feel relaxed and at ease as you move around the court, thanks to the open cell PU insole foam. On certain occasions, my feet felt like they were molded into my shoes, adding to my comfort. The upper shoe construction is also made with cushioning and comfort in mind. The upper feels super soft and squishy, so your feet don’t feel the pressure when you lace the shoe tighter around the top. The midsole with molded EVA foam and CCB technology provided excellent comfort and stability. These technologies worked together to give me that extra support I needed when moving sideline to sideline or net to baseline. I always felt ready and balanced for my next shot, including on defense. Even though these shoes give you extra support all around, they never seem to make your feet feel sore, which is something I truly appreciate in a tennis shoe. Moving around the court with these shoes felt very easy. Although they are relatively heavy at approximately 15 ounces, I did not feel like they weighed me down on court. They responded well in the heat of my matches, and allowed me to quickly transition from defense to offense (or vice versa). The midsole technologies kept my feet ready to run, and absorbed shock whenever I planted on the ground. The fit felt pretty natural and true to size. I generally have a long, narrow foot, but the higher cushion level helped these shoes fit around my feet naturally without moving. The one- lace closure really helps you get a close feeling to the tongue, upper construction and shoe laces. The padded tongue nicely softens the top, allowing me to keep the shoe tight and not worry about needing to readjust my fit. The Supreltech, Air mesh and DIA-Shield technologies work well to keep your heel trouble free, even after a long hitting session. One area that was a little disappointing was the breathability. Even though the upper construction is built to provide more ventilation, the cushioning levels still make this shoe feel hot. In warm weather, the cushioning will absorb and trap the heat in your shoes, and make your feet sweat. I would recommend wearing sweat-wicking socks with these shoes so your feet don’t feel drenched every time you play. Durability was my favorite aspect about this shoe, and Diadora made it sweeter with a 6-month outsole warranty! The Duratech 500 wearproof compound allows these shoes to really be tough, which is ideal for me as a hard court player. I didn’t experience any signs of wear or tear on the bottom or forefoot. Traction seemed to always be at its highest, even after weeks of playing on hard courts. You will be able to stop and start with ease, and not worry about losing traction. I found enough give to execute a lot of quick lateral and vertical movements without fear of turning over an ankle. There was also great protection from the hot court surface, which allowed my feet to stay ready. I was very impressed with the Speed Blushield 2’s. They offer a high level of comfort, stability and durability, which makes them a great choice for hard court players like myself. The breathability could be improved in future generations, but that may mean giving up some of the comfort or durability features. Players with wider feet may like this shoe as well due to its cushioning, support and removable Ortholite insole. 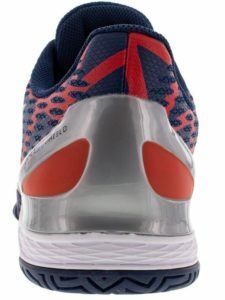 All in all, many tennis players out there will truly enjoy the feel and performance of the Diadora Speed Blushield 2 AG.